By its very nature, IntelliDeck is waterproof. It is a single .060”x 72” homogeneous piece of high performance PVC membrane. In fact, IntelliDeck traces its heritage as a solution to cover and waterproof decks over living spaces in the wet climate of Western Canada. 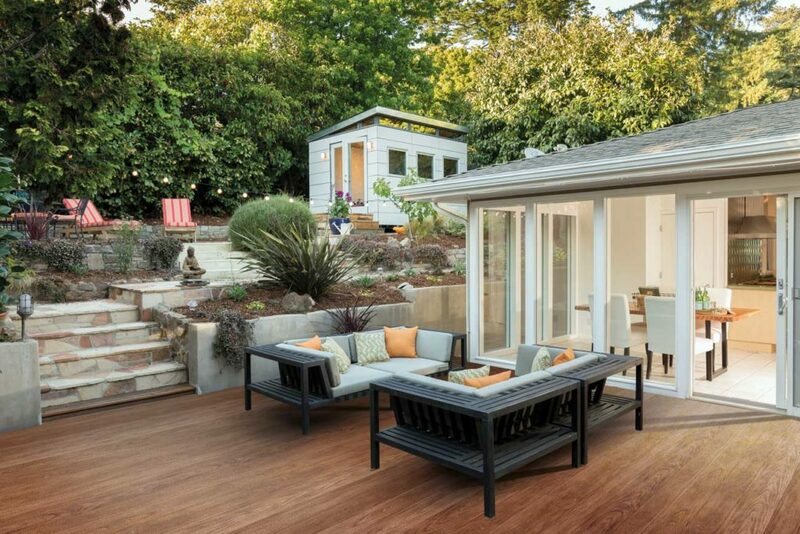 Unlike normal pressure-treated and wood plastic composite (referred to as WPC) decks like Trex, Fiberon, and Timbertech that don’t completely protect the substructure, IntelliDeck, when installed by one of our Factory Trained Installers, is a one-piece solution that can protect what’s underneath it for up to 30 years. Pressure-treated decks, Ipe decks, and WPC decks allow water, ice, pine needles, leaves, and more to leak between the boards. Every leak that gets through the board gaps erodes the substructure, ruins the subspace potential, and minimizes your deck’s lifespan. Ironically, some WPC decks have a 25 year limited warranty (pro-rated), but they’re installed over a substructure that only lasts ½ of their warranty period! In fact, the average lifespan of the substructure of a pressure-treated or WPC deck is only 8-12 years! Yes, you can add a very expensive waterproofing system under Trex and WPCs, but that’s a considerable added-expense. In many cases, the deck boards need to be removed in order to add this system. IntelliDeck accomplishes its waterproofing properties in just one step when installed by an IntelliDeck Factory Trained Installer. In fact, non-chemically treated wood is all that’s required for the substructure of IntelliDeck. Not only does this save you money but also protects the environment from potentially harmful chemicals of preservative-treated woods. IntelliDeck will waterproof what’s underneath your deck, porch, or balcony- not just the substructure, but the foundation and potential living space below. We are happy to report that IntelliDeck exceeds American Disability Act (ADA) slip requirements*. In fact, IntelliDeck’s slip resistance even improves when it gets wet. Furthermore, IntelliDeck is a code compliant product tested to stringent International Code Council (ICC) building product requirements, insuring that it’s a safe product to put on your house! *When testing is conducted on “clean” product. 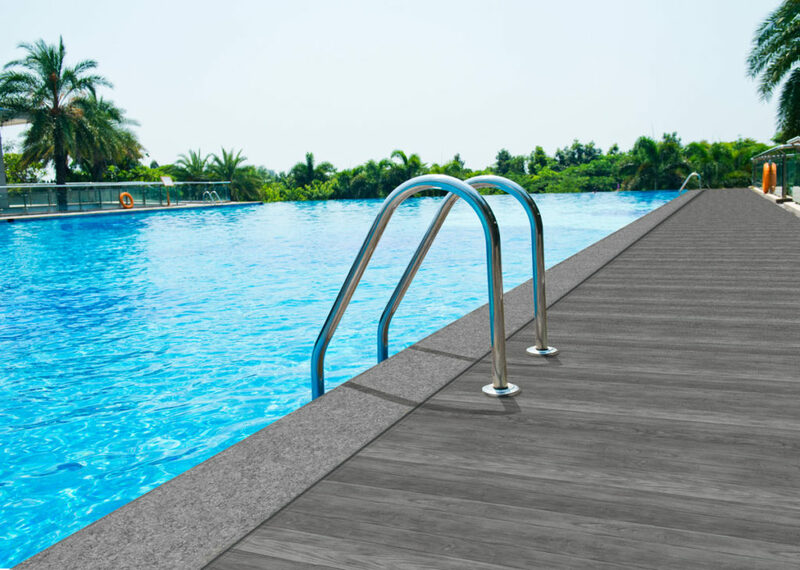 As with all horizontal exterior products, including wood, stone, asphalt, etc., any “contamination” such as sand, dirt, ice, frost, can alter the slip-resistant properties of the deck. Since no wood is used to manufacture IntelliDeck, there’s no need to worry about splinters in your children’s, your pet’s, or your own bare feet. If you’ve ever contemplated a pressure-treated wood or Ipe hardwood, you know there’s no getting around splinters with these types of installations. IntelliDeck doesn’t cut down trees or even grow trees to support its manufacture. In fact, IntelliDeck is a green product that uses recycled raw materials making it eligible of LEEDs credits. 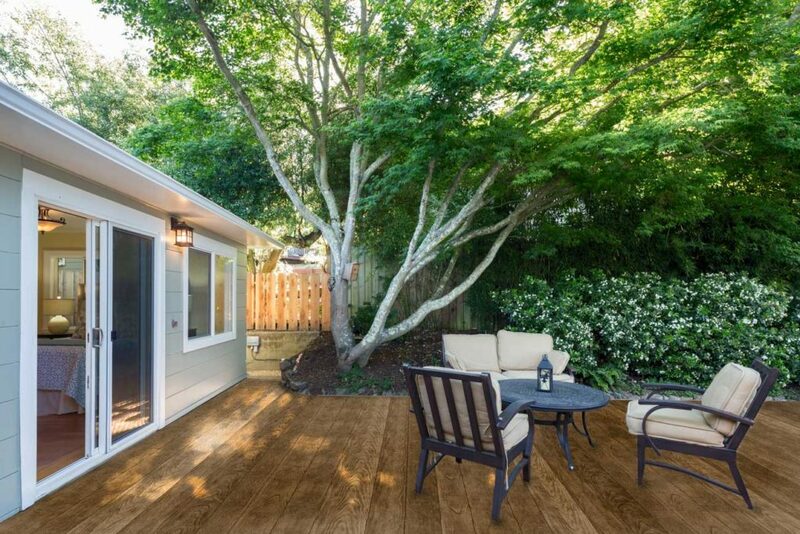 Are you planning a wooden deck for your home? You should know that very first time your deck is sanded, scraped and stained, it becomes more expensive than IntelliDeck. In fact, the first time you’ve performed maintenance on your deck, you’ve already paid for an IntelliDeck! Unlike typical high-maintenance wooden decks (like pressure treated lumber and Ipe,) IntelliDeck requires little maintenance to keep the product like new. Depending upon the environment, wooden decks can require work-intensive, time-consuming regular annual or semi-annual maintenance. Your wood, composite, or pressure-treated deck costs you TIME and MONEY. Depending upon the size of your deck, DIY maintenance can take days to complete. Who wants to spend their precious weekends sweating over their deck?? Paying someone to maintain your wooden deck for you can cost upwards of $1000! IntelliDeck requires little maintenance. If you want your deck looking as new as the day it was installed all you have to do is remove any dirt and pollen from its surface twice a year * (ideally in the Spring and Fall). That’s right! Maintenance is as easy as giving your deck 2 baths a year! Maintenance is easy! All you need as a mop or brush and soap and water, or the use of a pressure washer. (If you have a pressure washer, you should use a maximum of 1500 PSI and a fan nozzle). That’s it…2 baths a year is all that is required to keep your IntelliDeck in pristine condition! *Depending on the environment where you live. High pollen areas, dusty areas, and decks that have a proximity to dirt and sand may require an increased frequency of cleaning just like other outdoor products, such as siding, patios, porches, etc.